Following up on yesterday’s blogpost, as a Virginia criminal lawyer, I know the risks of appealing a District Court misdemeanor conviction to the Circuit Court. First, a criminal defendant’s District Court sentence does not cap the maximum possible sentence that might be received if convicted on appeal. Second, if a defendant appeals from a guilty, nolo contendere/no contest or Alford plea that involved favorably amending one or more counts or dropping some counts, on appeal the defendant can expect all original counts to proceed for the Circuit Court appeal. Any sentencing on appeal may or may not become particularly risky if the trial in Circuit Court proceeds before a jury, which is how the appeal trial will proceed unless both the defense and prosecution agree to waive a jury. Depending on the type of case and jury makeup, a jury might recommend a more favorable or less favorable sentence than a judge would impose with a bench trial. The trial judge is free to suspend and/or reduce some or all of the jury’s recommended non-mandatory jail sentence, but judges often reason for misdemeanor cases to keep intact the democratic will of the jury. Ideally, a misdemeanor appeal to Circuit Court would at least involve seeing whether the prosecutor even is ready for trial on the Circuit Court trial date, as sometimes witnesses become unavailable on a certain court date. However, Virginia procedure hobbles that approach by providing that an appeal cannot be withdrawn after one business day before the Circuit Court trial date. Va. Code § 16.1-133. 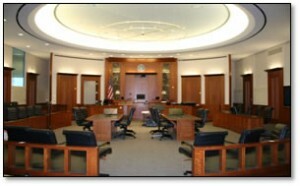 On the other hand, the defendant could take the risk of seeing if the prosecutor’s witnesses appear on the trial date in Circuit Court, and if the defendant wants to avoid the risk of a Circuit Court trial, his or her lawyer can talk with the prosecutor either about negotiation a better outcome than the defendant obtained in District Court or at worst can check about entering a guilty, no contest or Alford plea that reinstates the sentence imposed in District Court. During the pendency of the appeal to Circuit Court, the criminal defendant’s lawyer can schedule a hearing prior to the trial date on the defendant’s pending motions, for instance the motion to suppress evidence, and can proceed with settlement negotiations with the prosecutor. An incentive for the prosecutor to agree to a better settlement in Circuit Court than was offered in District Court can include that Circuit Court misdemeanor appeal trials are more time consuming with jury trials, and can even be more time consuming for bench trials in counties where prosecutors can dispose of many more misdemeanor cases in a day in District Court than in Circuit Court. If the defendant withdraws his or her appeal before the trial date in Circuit Court, the defendant will start serving any active jail time imposed in District Court at the time the appeal is withdrawn. Jon Katz defends criminal and DUI defendants in Northern Virginia, Fairfax County, Arlington, Prince William, Loudoun, Alexandria and beyond. To consult in confidence with Jon about your case, please schedule an appointment through is staff at 703-383-1100.